The display told us it is 40 degrees Celsius hot, sweat was running down our bodies in rivers, there was no wind on the little square in front of the hotel. 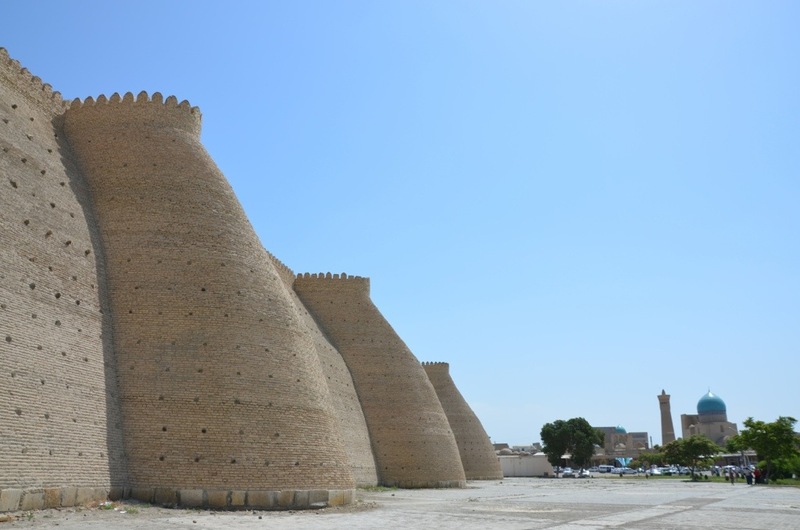 Only someone stupid would get into the car now and leave a place of such a magic like Bukhara. Or in a rush. 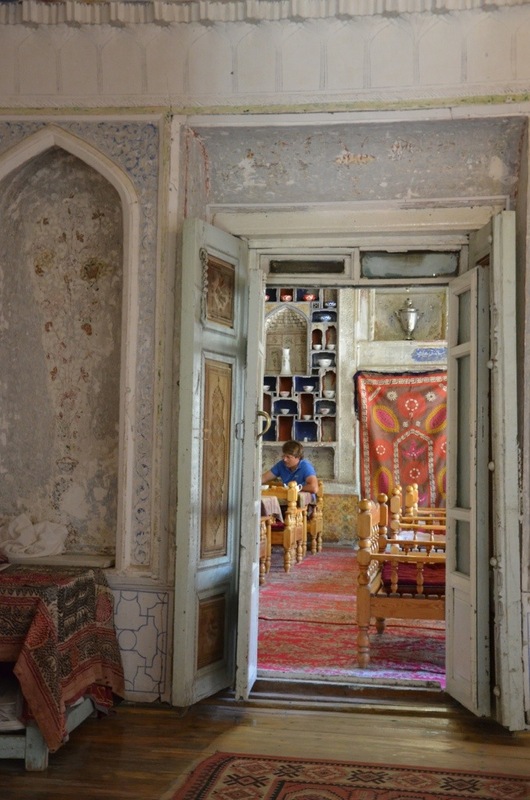 We had woken up in the very charming hotel Komil, built around several courtyards and hidden behind a big wooden portal, decorated with engravings, separating it from the shabby and dusty road. Breakfast was served in an amazing room with high ceilings and walls completely decorated with frescoes and ornaments, a mix of geometrical and floral designs. You eat almost more with your eyes admiring the many panels on the walls or the wooden bars of the ceiling, then tasting the great food. Out of the hotel, we walked down the road to the left with no expectations, and got caught by surprise by this spectacular town. It is a bit touristy, yes, but why should it not, in a country this poor this is ok, and the vendors don’t harass you as you pass their shops. 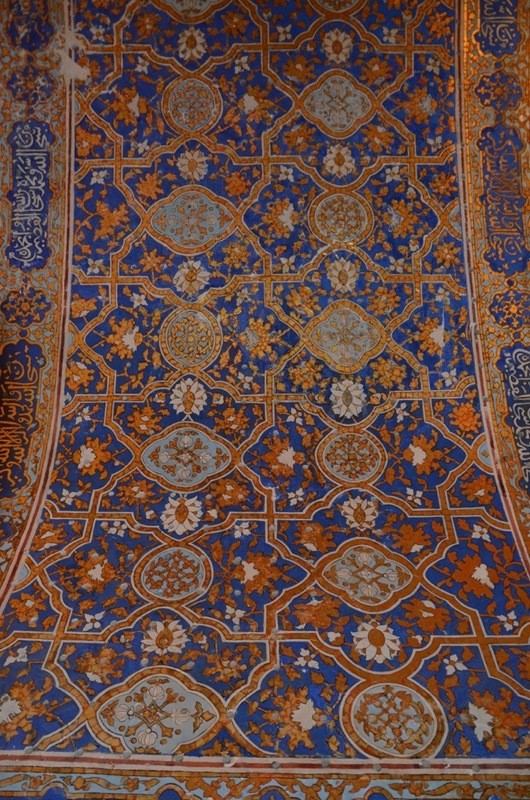 It also seems most items on sale are actually made here, we found no boxes with “made in PRC” on them as we did in Esfahan (Iran). We walked for 1,5h in a circle and passed small bazaars, mosques, medressas, an impressive minaret completely decorated on the outside and finally the castle, that we didn’t visit due to time constraints (!!!). The buildings are all very well kept, presented well, accessible, and it is a fantastic walk from one square to the next. The decorations on the medressas and mosque gates are so beautiful! Years ago I wrote an intro for a book about Turkish decor, mostly tiles, and got a basic understanding of Ottoman ornament. While this was a rather theoretical and academic exercise, here you I could dive into the real application of these designs. It felt like a sponge soaking up impressions in fast forward. The last piece of our tour led us through a non touristy part of the old town, the backstage part so to speak. 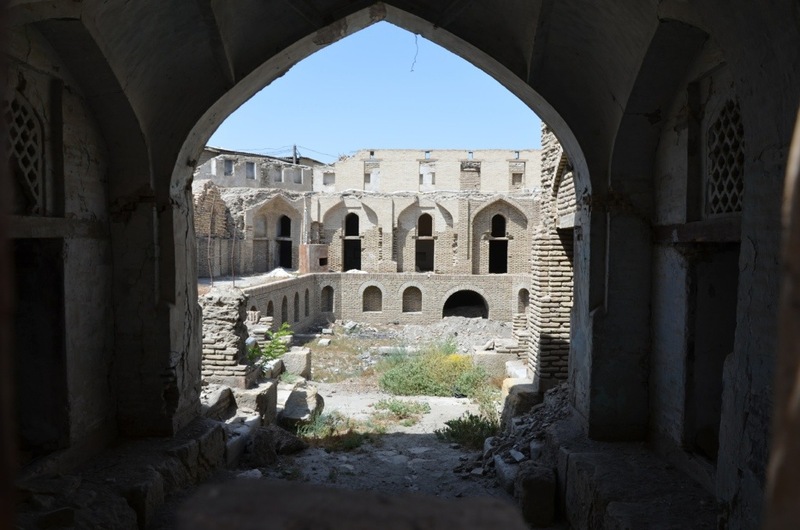 Run down buildings, soviet souvenirs, gas pipelines crudely laid through streets and along buildings, abandoned medressas, mudbrick walls falling to pieces, people sitting on the street doing nothing. We finally got back to the hotel, packed the car and left town, trying not to get mad that we cannot stay longer and forget the visa hassle that got us into this situation. 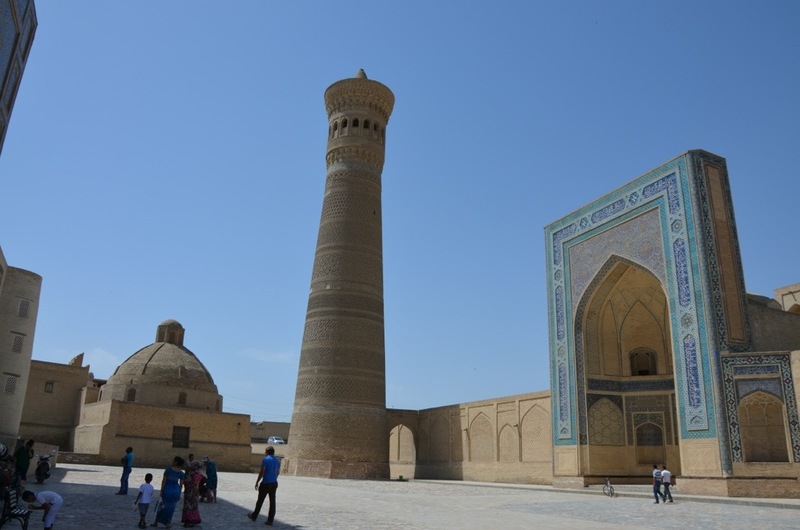 Bukhara, au revoir! Well, the air con soon got the temperature back to 30 degrees as we tried to find our way out of town and buy some diesel. Finally a gas station had some, and in record time of under 90 seconds the tank was full. Wow, surprise, I never got a refill that fast. But then next surprise, a liter diesel costs 3000 Uzbek SOM, approx 1,30 USD. Cheap for Europe, terribly expensive for Central Asia! This is 10 times Iran and 6-7 times Turkmenistan. We were surprised to be so surprised by these prices. You get used very quickly to prices going down, but prices going up are noticed immediately and don’t go down well. We had lunch on the way, in a strange roadside restaurant that seemed like in the home of someone, with a separate dining room that was thoroughly filthy. Everything felt dirty, from the walls to the benches to the spoons to the tea cups. But the food (salad, samsas, chicken) was good, maybe a little fatty 😉 As we drove along flat, boring plains, the sun disappeared behind the clouds and it started to look like rain. 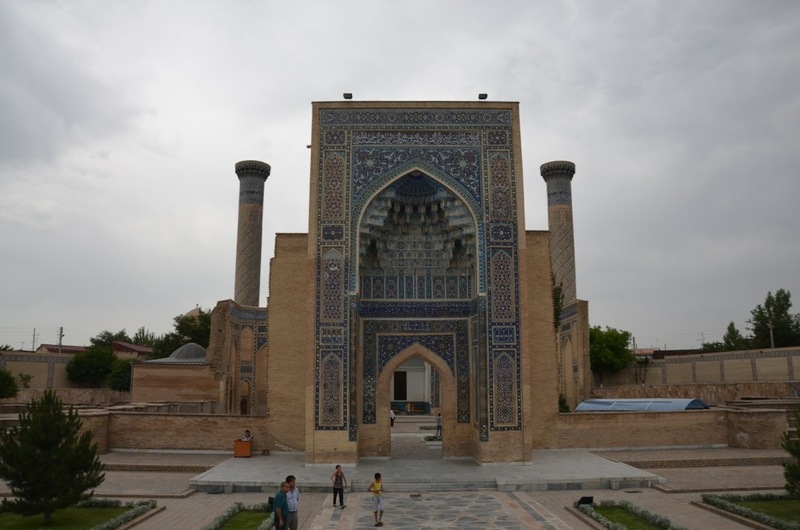 Hours passed until we reached the famous silk road city of Samarkand, far too late. 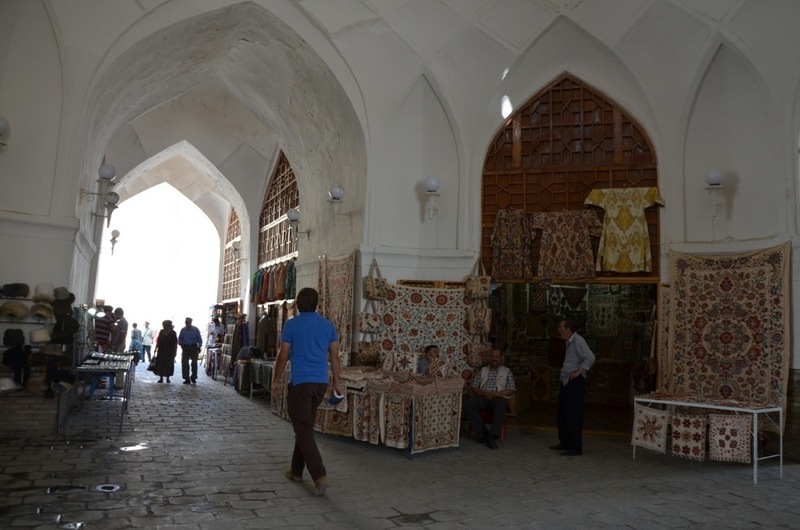 As we entered town, after having seen Bukhara, expectations were high. 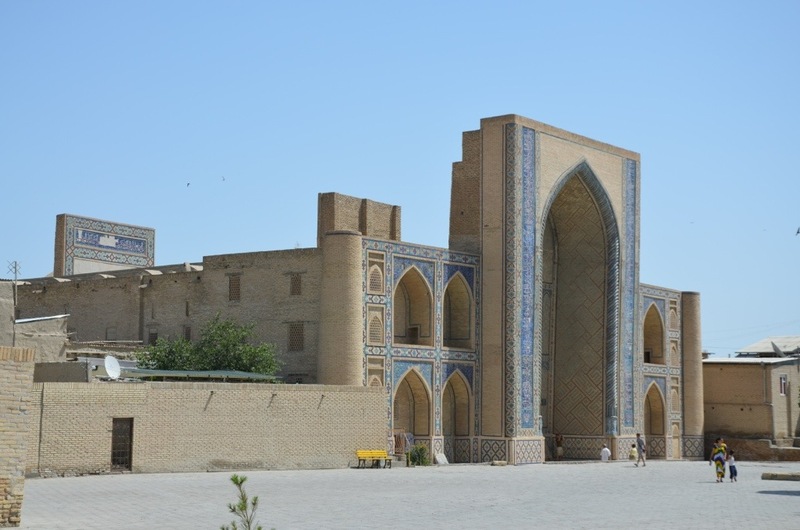 The first building we found was Tamerlane’s mausoleum. Truly spectacular! 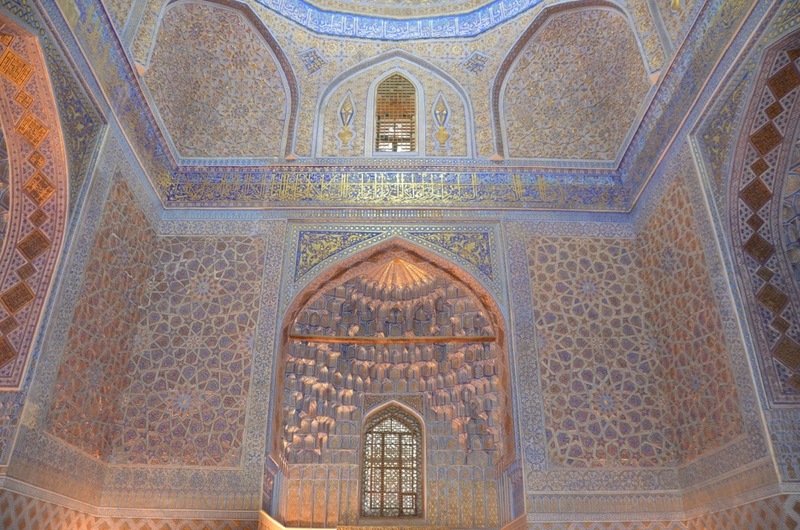 We have by now understood how the mausoleum architecture is usually set out, and that the decorations on the inside and outside walls make the difference. So our focus is more on decor then buildings by now. And this place is among the most beautiful we’ve seen so far. Once you enter the main hall the sheer amount of gold and blue ornament is astonishing. We left silently, still digesting this overdose of beauty. 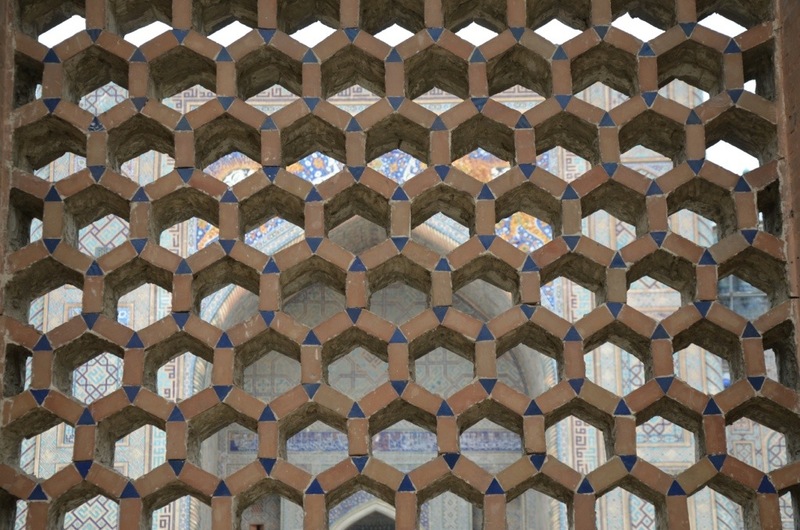 Next stop was the Registan, a complex of three medressas (video here). Each with an own portal and garden, the three buildings form a square in their middle, where a TV show with dances of dozens of young girls was prepared. Dancers, trainers and choreographers were all very young, in heir early twenties we guessed. The defilee of country banners carried by the young girls over the runway covering the entire square to the tune of folk music and commented by an MC we couldn’t spot seemed unreal, like from another planet. Anyway, we tried to focus more on the historical buildings, and they are truly beautiful, with an amazing richness and variety in ornaments. 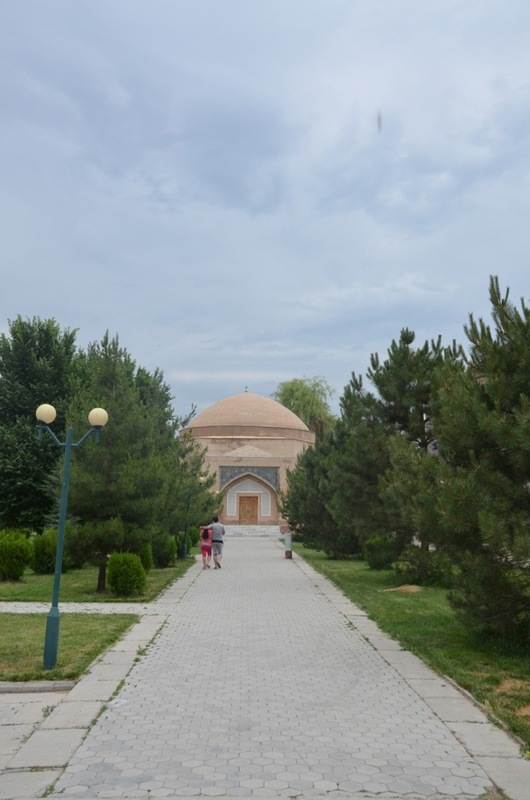 Every medressa has its own particularity, they all have trees and benches in the courtyard, offering a place to chill in the heat of the day. 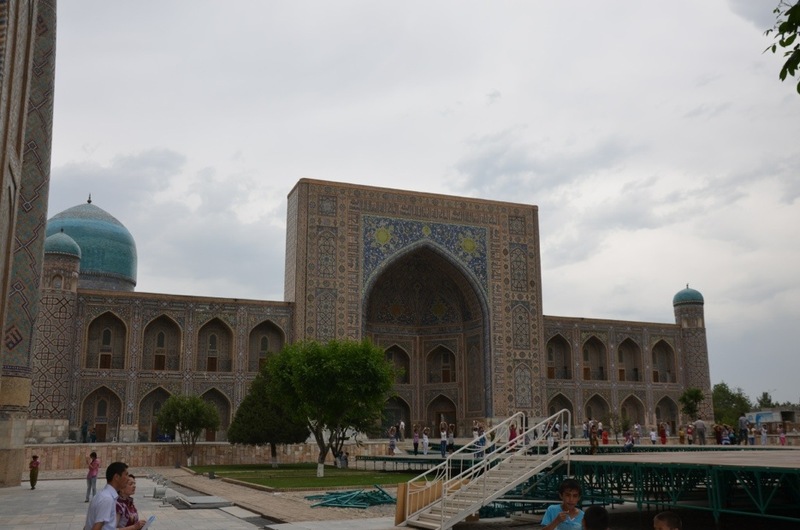 When we finally left for Tashkent it was already very late, and after 2h it got dark. 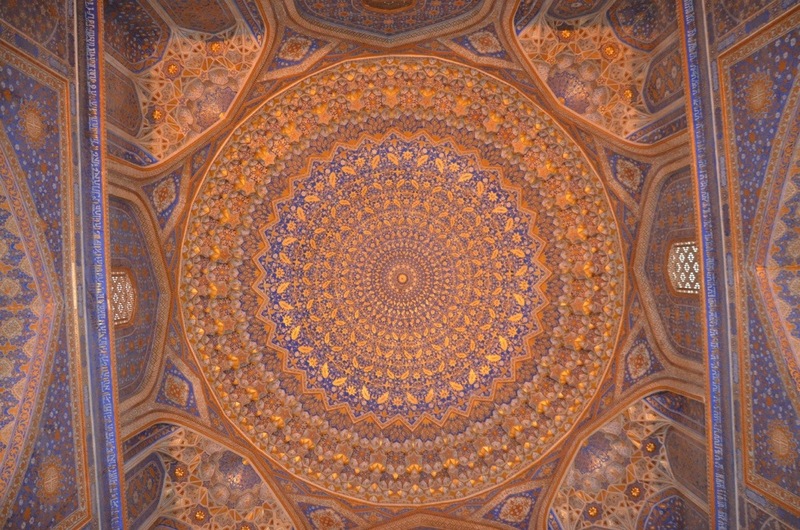 The driving style in Uzbekistan makes you go nuts in no time. In Uzbekistan somehow the longer you drive, the more km it takes to reach a place according to the few occasional road signs. Or we just don’t find the straight roads. Anyway, we reached the city at 21:00, and spent another hour trying to find orientation and ultimately the hotel. We really need to stop the night driving, it’s dangerous, boring, and can kill morale. The friendly receptionist at the Hotel Bek found us a restaurant open at this time and not too far away. We found it quickly and had a late dinner with Russian salad, Uzbek ratatouille, and two Uzbek shashlik skewers (that are smaller then the Kirgiz ones as we learned). We could pay with credit card, although it took us fifteen minutes to get the machine to work, a clear sign that things are going better again. Tomorrow we’ll have to speed up to exit Uzbekistan. Before falling asleep we sent all kinds of blog posts, pictures, app updates etc into the upload and download queues, since the hotel has WiFi, although a painfully slow one.